The communists celebrate, because Beijing’s great economic progress forces Europe and the U.S. to act as if they were its colonies. But they do not understand that without reform of the economic system - and especially if they fail to insert democracy within their domestic politics - they will not be able to avoid social unrest and the collapse of the one-party dictatorship. The analysis of the great dissident. Washington (AsiaNews) - The so-called China model is designed to treat the developed countries as a new type of colony and use them for commodity dumping. This statement will make many "patriotic" angry Chinese youths feel triumphant: now here comes the revenge, we are a sovereign state able to dominate them as colonies. Ever since the anti-imperialist cultural and political movement of May 4, 1919, the propaganda by the Chinese intellectuals that was distorting history and inciting hate is still poisoning the minds of many. However, the dreams of a fool's paradise by these angry youths are not as great as they seem. Although the developed countries have become dumping grounds like colonies, the newly emerging industrialized countries have not become sovereign states ruling over these developed countries. The reason is because people's incomes in China and other newly emerging industrialized countries have not significantly improved, and their domestic markets, infrastructure and technological levels are not increasing simultaneously. Instead, the markets are flooded with low-quality goods. The quality levels have been declining globally. This is the era that one can make a lot of money without advancing science and technology, or improving quality. What one needs to do instead is to maintain a low human rights standard among the laborers, rather than a high-tech advantage. The global politics under the control of global capital are all at work to maintain this "advantage" of a low labor rights standard. The people in the newly emerging industrialized countries have much less income than those of the "colonized" markets, along with even lower human rights and even lower consumption. They are even less than these people in the colonies. They are the slaves for the colonies. So who is the exploiter, who has the sovereign rights over the colony markets? The answer is: transnational capital. Nowadays, the capitalists do not oppose the Chinese Communist Party (CCP). The CCP is capitalist itself. Their slogan is "let all the capitalists in the world unite, so that some people enjoy a prosperous life." The premise allowing some of these people to get prosperous is the global free trade under unfair conditions. Its foundation is the deprived human rights of the people of these emerging industrial countries. Its consequence is the economic recession in the developed countries, as they move closer to the less developed countries. Its method is not rent-seeking of the capital, but a controlled politics that is well planned and well organized by capital to serve for the lower human rights standards and unfair trade. Global free trade has been transformed into a tool of transnational capital for excess profits. It has lost the functionality it once had for promoting the global economy after World War II. The most important variable in this transformation is the so-called China Model. Despite the name of global free trade, it has already deteriorated into a global unfair trade. For the developed countries, unfairness is reflected in the low human rights standards of their competitors. The authoritarian political system guarantees unfair low labor cost. Coupled with unfair measures of market access, high-quality merchandise is only squeezed out of the market by the inferior goods. To the newly emerging countries, unfairness is reflected in the income of the working-class, which is not synchronized with the growth of the economic development. An undeveloped domestic market inhibits economic development, inhibits technological progress, and contributes to political corruption. This phenomenon can be seen in almost all the newly emerging industrialized countries. With both developed and emerging countries being harmed, will this global trade economy be sustainable in the long term? The answer is no. That is because the scale of global consumption growth is less than the actual growth in production. Production rate will be difficult to maintain. The financial surplus-induced recession is only a beginning, and a warning. If there is only a financial surplus, then inflation will automatically balance it. But the reason for the financial surplus is because of the excessive profits due to the global trading system. Therefore, the market cannot automatically balance it. The result of the self-balancing becomes a starting point: on balance the next round will continue downward, which means continued economic decline. In another words, GDP growth has not brought growth in the global market, while the excess profits will still bring excess growth in financial markets. The rate of inflation will continue to accelerate, but will always fall behind the financial growth rate. On the one hand is the surplus of goods, and on the other hand is the excess money. Both cannot flow freely, but are hindered by the highly profitable market rules and extreme disparities of income. This hindrance is the reason which lead to economic crisis and foreign expansion in the past few centuries. In this crisis, the actual situation in China is worse than in developed countries. The semi-closed market in China prevents the automatic adjustment of the market. This closure continues to improve conditions for excess profits, while it further increases the gap between rich and poor, and inhibits market development. Thus, the degree of recession in China is much larger than that of developed countries. As the current global trading system cannot automatically adjust and cannot automatically balance itself, every country has to take their own measures to restore a balance of the markets in their own countries. The first step is that the actual colonial states have to enforce trade protectionism, to resist the overall dumping. If, as happened in the nineteenth century China, it cannot stop the dumping of cheap goods, then the result will be a national economic recession with declining industries and growing unemployment. Eventually, politics will be controlled by these external forces for economic reasons. This has gradually become the reality in the USA. Therefore, in order to save themselves, the Western countries must take protective measures to reverse this trend. Western democracy is struggling with the capital now. 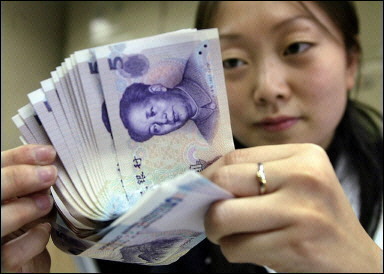 To force the Chinese currency RMB's appreciation is just the beginning of self-help, but not all that is required. In this process, inevitably China will be subject to strikes on its export. Surely the so-called export-oriented economic model will not be able to be maintained. Here, there are two possible options. The first option is to plan ahead. China should proceed immediately to expand the domestic market while reforming the currency and commodity markets. In this way it will quickly balance the domestic market via the international market, and get over the difficulties of economic recession by cooperating with the developed countries. However, this option is at the cost of losing the excess profits of the international and domestic capital, and reducing support for authoritarian politics. The difficulty now is that China's existing one-party dictatorship with the support of the big capital could hardly to make this compromise, unlike the fight that is going on between the capital and national interests in the Western countries. China's national interests have long been subordinated to the interests of capital, and there is no democratic process that can correct it. So the CCP is left only with the second choice: to adhere to the semi-closed market and closed monetary policy, taking one step at a time. Besides occasionally making small compromises when it is forced to, the ultimate goal will be to keep the excess profits of the China Model in order to win the continued support of global capital. But the difficulty is that this choice will force the West to speed up its process of protectionism and simultaneously speed up the outbreak of social conflict in China, thus speeding up the collapse of communist regime. The Jasmine Revolution in the Arab world was promoted in this way. However, the greatest difficulty is that the CCP is controlled by the big capitalists, for whom it is impossible to give up excess profits and impossible to truly initiate the reform process. Thus, capital and the CCP can only take China into the abyss, and cause a new round of global economic turmoil. Why did Barack Obama fail in China?